Today is my mosaic anniversary. Eleven years ago I met Julia for the first time who introduced me to mosaics. The story is well documented but I still smile when on leaving she said to my hubbie Alan “You won’t believe what she has got into” and I said “No, I ‘ve made one mosaic but I don’t think I’ll be doing anymore” Talk about famous last words!!! Since then I have made hundreds of mosaics – it would be interesting to know exactly how many but it is impossible to count them all. I have exhibited at a National Trust property 3 times, had several commissions, been part of Richmond Open Studios twice and this year is my second time in BEAT Ealing Art Trail. 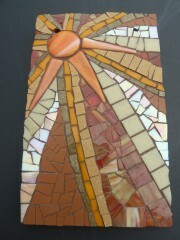 I have given lessons and talks on mosaics as well as working on a 2 year community project. I am in 2 galleries, a professional member of BAMM (British Association for Modern Mosaics) and I have also appeared on TV. So much for my blasé comment to Julia! I often wonder what I would have done had I not got into mosaics. There is no doubt that I spend a lot of time not only making them, but also thinking about them, planning, designing, updating my website and Facebook. Wondering what new areas they can take me to……..an RHS Garden Show would be a dream come true – I’m just putting it out there! But for me the most important thing was that eventually I found my artistic medium. So, have a look at my short video to follow my journey so far. I created my first Blog in July 2014 when this website went live. I have tried to post on a fairly regular basis every 2 – 3 weeks. I usually write about my latest commissions, exhibitions and events and anything else I think might be of interest. I always get lots of comments (mostly via email rather than direct to the Blog) and because my posts automatically go straight through to Facebook I get a lot of interest from there and that often attracts new Blog followers (vice versa). Please let me know which Blogs you like the best – is it my ‘journey and inspiration’ or about new commissions and my charitable mosaic work. It could be information on events, exhibitions and galleries I am involved in. Is there anything specific you would like me to Blog about – it could be more info on techniques, top tips etc. Maybe you would like a ‘series’ on something? Do let me know as you are the guys that read it and I am always keen to increase my followers. This is my last Blog of 2016 so I would like to thank you all for supporting me during 2016 and wish you a very happy, healthy and fun Christmas. Enjoy all the festivities in whatever shape and form they may take and I look forward to seeing you all in 2017. You may have noticed it has been a bit quiet on the Blog front recently. That is because I have been away on a Cross Country ski-ing holiday in Austria. We had a fantastic time and I am pleased to report that all my limbs are in tact and where they should be – which has not been the case on the past 2 ski holidays! (email me for gory details!!). Its lovely being away from it all in the mountains with the clear air, silence, stunning views, snow and sunshine. The scenery is breathtaking and I certainly get inspired in that environment. I hope to be able to translate some of my photos into mosaics over the next few months. The first time I went cross country to Norway I was inspired to make this piece, entitled ‘Norwegian Moonlight’. I will have lots of exciting news to report over the next few months but I thought this would be a good opportunity to ask you, my Blog Followers, what you like to hear about in my Blogs. Since starting the Blog in 2014 I have mostly written about events, commissions and my mosaic journey. I have a lovely loyal following which seems to increase every month – so thank you everyone. What was it that attracted you to my Blog? Which of my Blogs do you like best – stories, pictures, inspiration, events, commissions? Is there anything I don’t mention that you would like to hear about? How can I make sure I keep your interest and you find my Blogs informative, fun, readable? Do let me know, after all, you are the ones I am writing for so please help me to keep you reading. 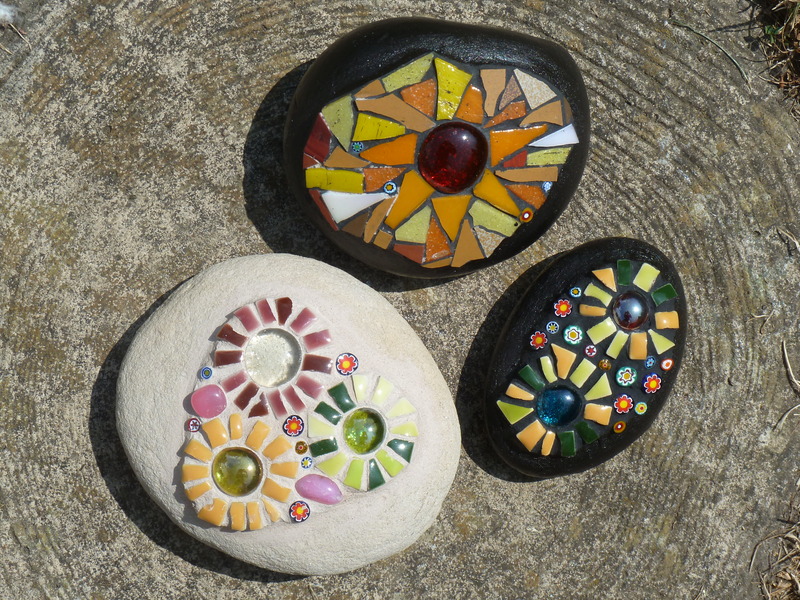 Obviously I love making the mosaics, but I also really enjoy all the marketing, networking and PR that is required if you want to reach a wider audience, which I certainly am hoping to do with the help of this website and word of mouth. That is part of the reason I enjoy having exhibitions and getting into new venues so much as I love creating the posters, flyers, press releases and going out on the network circuit to promote them. I enjoy the whole process and project. During my mosaic journey I have had a variety of business cards and flyers in various colours and designs although I do like the ‘mosaic tile’ effect and think it works well for me. I am hoping my latest business card has gone up a notch and will appeal to my target audience of gallery owners / people wanting commissions. 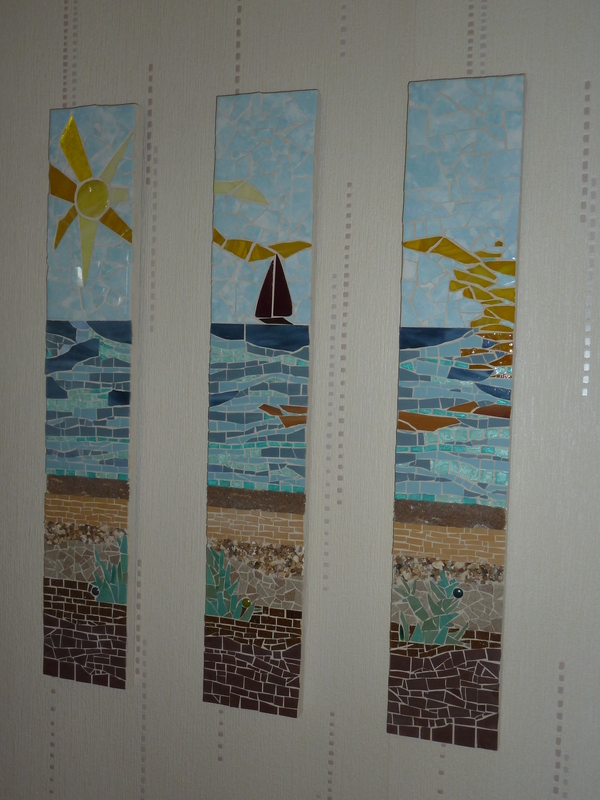 A few Blogs ago I gave a mention to Louise from Ealing Digital who set up this website to help me market Rosanna’s Mosaics to my target audience. However, an even bigger ‘THANK YOU’ must go to Dr. Simon Davey who has in fact created 5 websites over the course of the years for me! I first met Simon when I was working with Business in the Community. He created a website for my ProHelp Programme, which brokered professional skills into the voluntary sector – amounting to £1 million pounds worth in one year. “I lead projects. I take an idea and turn it into a plan and then build a small team to make it happen and get on with it. Most of my work is with young people or technology. Sometimes both. Big picture and attention to detail – it gets me out of bed in the morning and gives me a reason for living. REQUEST: Who do you know that could benefit from working with Simon? COMING SOON: New month, new news! It is exactly a year ago since I decided to dip my toe into the cyberworld of Blogging. I had hardly read any Blogs and didn’t really understand what they were. However, when I decided I wanted an updated website that I could easily add events and photos to, I realised that nowadays most wesbites come with a Blog automatically. So, always one for a challenge, it was time to give it a go. Louise Honan of Digital Ealing who lives nearby and I had known for a while helped me in all things Blogging and she set up the website for me. messages I wanted to put there – this is what I do, this is what I can offer, requests for help etc. The result is this website which I think, and I hope you will agree, is a great resource, user friendly, interesting and informative. I think it successfully gets across my mosaic story and progress over the past 8 years and you also get a bit of a feel for my personality and sense of fun. Do you agree – let me know. REQUEST: Having Blogged for a year now, am I getting it right? What would you like to see in these Blogs – more pictures, other mosaic info, anything else? Have your say by leaving a comment below or email me. As part of my January spring clean I have spent quite a lot of time amending and updating this website. Although I already had a mosaic website, I have decided that this is now going to be my main website and I will be directing all traffic to it via business cards, marketing materials etc. Originally I wanted to use this website as a showcase for my mosaic photographs with a view to attracting some Galleries who may want to display my work. This is still a key aim. I also liked the idea of ‘Blogging’ and although I am very new to it, I seem to have loads of topics to chat about and people seem to like the Blog so I will continue with this. I am now going to use this site to promote other areas of my mosaic work and services, as well as listing useful mosaic contacts. Have a look at the additional pages I have added and let me know what you think. I’d also like you to let me know what else you would like to hear about – anything mosaic orientated is open for discussion. It is very easy for you to send me a message, just press on the ‘Leave a comment’ button at the bottom of this page. I usually reply quite quickly and I love hearing your views, comments and questions.